Han Won-joo is a doctor at Magnus Hospital, a nursing home located in Namyangju, Gyeonggi. 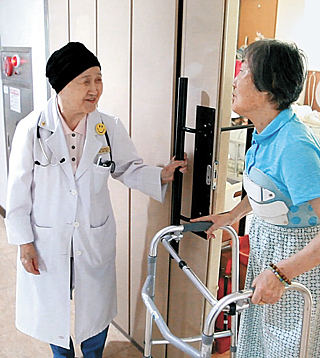 Although she is 91 years old, she meets patients daily from 9 a.m. to 5 p.m.
Han spends the entire week at the hospital tending to patients. She lives at the hospital from late Sundays to Friday afternoons, when she returns to her home in Seoul. All of Dr. Han’s patients are old – but most are younger than her. Dr. Han has received an award from the JW Foundation, which was created by JW Pharmaceutical. The award is named after the company’s founder Lee Ki-seok and honors people who have dedicated their lives to medical services. Dr. Han, who was born in Jinju, South Gyeongsang, graduated from Kyungsung Women’s Medical College, which today is Korea University Medical Center, in 1926. She earned a doctorate at the same school before moving to the U.S. to further her studies. After returning to Seoul she started her own hospital. In 1979 she closed it and became the head of a hospital run by the Korea Council of Healing Mission. Han was inspired by her father, also a medical doctor, who said it was the medical profession’s job to help the weakest and most vulnerable in society instead of chasing profits. Her father believed in volunteering before the idea became fashionable. Han stepped down from the Korea Council of Healing Mission hospital in 2008 at the age of 82. But she wasn’t jobless for long. She said she wanted to look after older people like herself at a nursing home hospital. She said fear of death and the emotional distress of being neglected by their families are her patients’ biggest challenges. When asked if her own family members advise her to retire, Han said they have no reasons to do so. Her son is a doctor at Asan Medical Center, and her son-in-law runs his own nursing home hospital in the greater Seoul area. “It is my own stubborn decision not to work at the hospital run by my son-in-law,” Han admits. After a day’s work, she does her rounds for an hour every day, seeing all the patients. She is skilled at new technologies. She responds to emails and has a Facebook account. After dinner, she reads until 10:30 p.m. and is asleep by 11.